March 20th 2013, I had just settled into my chair for a Wednesday night church service. The service was already underway. I was later than usual because I was finishing my duties for the church parking lot ministry before I made my way into the sanctuary. Since I was late, I sat in the backside of the auditorium. A spot I had never sat before. Normally, I would sit with my friend Kevin closer to the doors on the other side of the sanctuary. We also liked to sit up front. We joked that the closer you sit the closer you are to the, “Holy Spit!” Tonight, however, these differences would be only the beginning of what would become no ordinary service. Not for me at least. I was about to get my first ever word of knowledge – which is a gift of the Holy Spirit that manifests in God’s appointed time – spoken over my life. I the months I had been a member of Church on the Rock in St. Peter’s, MO I had seen a few video testimonies of people who had received a word during service that later proved to be true later on. One of the stories that stands out most was one about an elderly woman who had red bumps on the inside of her mouth and throat. The woman and her husband had been to various doctors for years trying to discover what this ailment was. Their doctors seemed to be perplexed about what exactly it was and how to treat the symptoms. The couple heard a word of knowledge from the pastor about God healing a woman in the congregation who was suffering from abnormal red bumps inside her mouth. The elderly woman knew that word was for her. They went to the doctor two weeks later and the bumps – which had both been in her mouth and gone undiagnosed for years were now gone without a doctor’s explanation. She was completely healed. I was fascinated and excited when testimonies like those were shared with the church. I think those kinds of stories reflect some of the best parts of God’s love for us. I get goosebumps hearing stories of the supernatural moments of God moving in our lives. I call them, “Can’t Make This Stuff Up” testimonies. As excited as these stories made me, however, I never thought I would get one for myself. God was about to personally deliver a can’t make this stuff up testimony in my own life, even though I sat on the wrong side of the sanctuary and also showed up late to service on that Wednesday night in March. Pastor Blunt began and preached his sermon like normal, up until he paused almost in mid-sentence to give a word of knowledge that would change the course of my personal life and also the lives of those closest to me forever. He said, “There is someone here tonight that is going to get a huge opportunity in their job or career thing tomorrow. It’s going to change the way you live. Everything is going to happen for you. Tomorrow is the day you’ve been waiting for and I don’t know who you are, but that will settle right there on the inside and that will bear witness with you tonight. Notice that God’s going to give you grace tomorrow and not just tonight. What is His grace? Favor and Power to deliver from all afflictions including recurring moments where you rob Peter to pay Paul and you can just never get ahead. Well you are about to get ahead. As Pastor Blunt shared that word of knowledge my spirit jumped. I felt a warm presence of the Holy Spirit come over me and I knew that message was for me (I don’t know who you are, but that will settle right there on the inside and that will bear witness with you tonight). The message that God’s vision for my life was about to be happen settled right on my inside and I became very excited. I had never been fully set free from my addiction until this moment either (What is His grace? Favor and Power to deliver from all afflictions). My name John by the way means grace. After I went home I was like a child the night before Christmas. I laid in bed unable to sleep because I was so eager to find out what God was going to reveal to me the next day. The next morning, I woke up early and was ready to seek after God. I wasn’t sure how God was going to reveal His plans to me. I thought for sure, however, that He was going to tell me I was going to be a music producer because I had recently watched a documentary on the subject. I couldn’t have been farther away from the truth. By the time I had to drive to work that afternoon, I still hadn’t heard from God and my thoughts started to waver. “Was that word last night really for me? Was God really going to tell me what He had planned that was going to completely change the way I live?” As I got ready for work I told God that whether He told me now or right before I fell asleep I was going to maintain high expectations that He was going to speak to me today. I walked to my car, pulled out into the lane and stated ahead the first stop sign on my street. I turned on my blinker to turn right and then I heard Him. That same loud thought I had heard the night I was born again and that same warmth I had felt the night before during service. The answer to a prayer I had prayed every day for nearly six months trying to find God’s sentence for my own life. Those words changed my actions, thoughts and beliefs. For the first time in my life I was about to start pursuing the life God had for me instead of the life I wanted for myself. What I found was that no life I could have chosen would be greater than the one God picked out. For more information about Testimony House vision and our current building project click here. If you would like to support Testimony House’s to continue adding daily Christian content via blogs and videos please partner with us here. 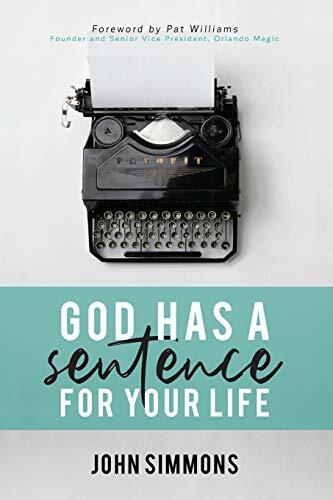 Release Day is Here - God Has a Sentence for Your Life Available Now!! !